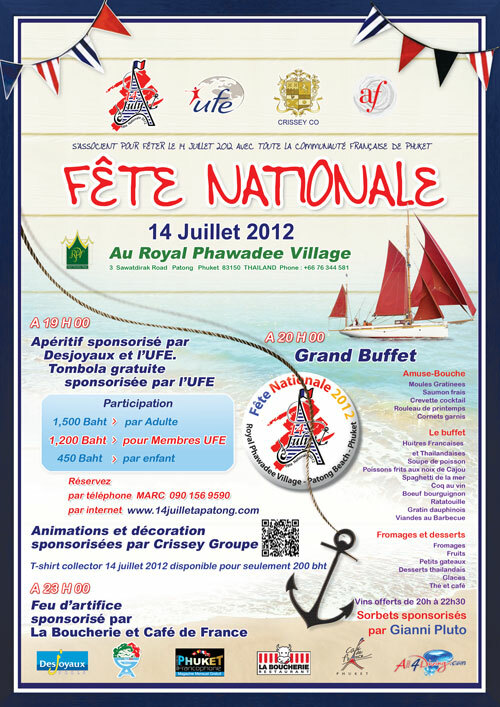 Every year, since 1999, we organized the French National Day celebrations on July 14th at Royal Phawadee Village in Patong, Phuket. This event has become an institution and attracts more and more people attending each year. For 2012 the theme will be ‘SEA WORLD’ – a dream place featuring scuba divers, a beautiful mermaid and other aquatic presentations during the evening. The party will start at 7.00pm with an aperitif from a traditional-style French bar. The buffet will offer many different types of sea food and iconic French dishes. Free-flowing wines will be available between 8.00pm and 10.30pm. Tickets are available from the website www.14julypatong.com at Baht 1,500 (for UFE members Baht 1,200) and for children at Baht 450. Join us for a dynamic and festive evening and bring your dancing shoes! You will be most welcome.